Every year in America, approximately 38 million plastic bottles end up in a landfill from bottled water, not including soda. It is estimated that 80% of plastic bottles are not recycled and can take up to 700 years to begin composting. 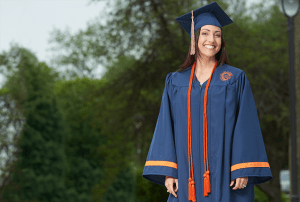 Herff Jones’ EarthGrad and Renew graduation caps and gown are made from 100% recycled materials. Both Renew and EarthGrad™ fabric are certified as being manufactured from 100% post-consumer materials. By using these materials, your institution generates demand for recycled materials, creates jobs and reduces the amount of materials that go into landfills. Learn how Herff Jones and Framing Success are partnering with Trees for the Future to support the environment. Herff Jones and Framing Success are offering bookstore partners free marketing supplies to aid their diploma frame sales efforts. From event kits to signage and brochures, we have you covered.